Just occasionally in sport something happens in an event which has consequences way beyond the event itself. In cricket Australia, under Steve Waugh, changed the face of Test cricket with their four runs (or more) an over innovation that some other Test sides now adopt (notably by England at Edgbaston last year when their 407 runs in 79 overs on the first day took the fight back to the Aussies after the Loss of the first Test at Lord’s). Sunday’s astonishing events at the Wanderers in Johannesburg may well be a similarly watershed moment for cricket. Twenty20 cricket has showed that it is possible to score at eight or more runs an over for twenty overs without any artificial restrictions being placed on the bowlers or fielders. The 872 run feast in Jo’Burg has shown that it is also possible, on a good wicket, to maintain this pace in the longer version of the game. I imagine that Graeme Smith’s talk to his team after they had been hammered all around the park by Australia and conceded a record 434 runs went something along the lines of “If they can do it, then so can we!”. His team believed him, and self-belief in sport is everything. I would have said that it was impossible to score 434 runs in 50 overs against a side with bowlers as good as Ntini, Hall and the rest. 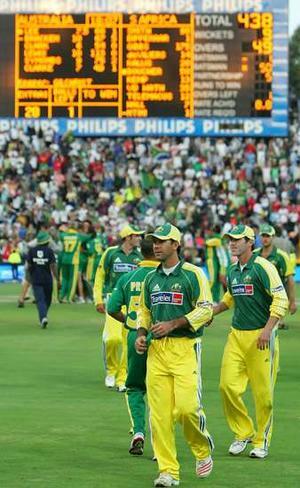 But Australia had done it - so the Proteas thought that they might as well try and do it as well. And they succeeded – good for them! Whilst Twenty20 may have been the model for Australia and South Africa’s approach at The Wanderers oddly the format may be the casualty if the events do set a new trend for the traditional one day 50 over game. Who needs Twenty20 if similar excitement can be generated over the course of a full cricket day? I like cricket in all its forms (I’ll happily watch kids playing in the street using a drinks crate as a wicket) but I am not a big fan of Twenty20. There is an artificiality to it which is jarring and the matches do seem rather trivial - fun but lightweight. There was nothing lightweight about Sunday’s Fifty50 extravaganza. Hectic it might have been, and the bowlers of both sides may now be in therapy, but it was certainly proper cricket. 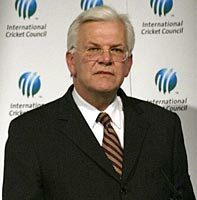 The proposals for a Twenty20 world cup have not been welcomed by all the members of the ICC – India is against the scheme and I think that they are right. That One Day Internationals had become at times a bit predictable, even dull was true, but the Australians and the South Africans have now crated a new ODI paradigm. How long before the first commentator says something like “India only need eight an over to beat England in the ODI at Goa, this should be well within their capability!” My football team has the motto “Audere est facere” which means “To dare is to do”. Not a bad motto for a team in any sport. The South African’s dared on Sunday – and they didn’t half “do”!